Fit-again Warwickshire paceman Chris Wright is keen to come back a stronger, fitter and better bowler after making a full recovery from last summer's season-ending back-stress fracture. The England Lions man warmed up for the Championship opener with Sussex on Sunday by claiming two scalps for the Bears against Oxford MCCU in The Parks. And Wright, 28, says there is no reason he cannot recapture his form of 2012. "There's more knowledge about stress fractures now," he told BBC Sport. "I've been speaking to our physio, as well as the physios at the ECB. "And there have been some really high-profile ones. "Jimmy Anderson and Graham Onions both had stress fractures and become almost better bowlers afterwards, having become stronger and fitter. "I am hoping that the same will apply to me, having had a rest from bowling. "It's never ideal to have a serious injury like that. But, fingers crossed, I'm ready. I've done my rehab. "I've spent a lot of time in the gym, but I quite enjoy the gym work and I came through our pre-season in Barbados ok."
Wright's absence for too much of last season was a key factor in the badly-injury-hit Bears' fall from title winners in 2012, when he took 67 first-class wickets, to fourth place in 2013. Not that he considers that an acceptable excuse for last summer's comparative failings. "We have great support at Edgbaston," said Chipping Norton-born Wright. "And the members have every right to expect us to win. "We had lots of injuries and not a lot of luck, but I still think we're better than fourth. "It was a poor effort by our standards, with the strength of our squad. In fact, we under achieved in all formats. "But this summer we've got Jonathan Trott and Ian Bell around for a bit longer and a seriously strong squad with a lot of self belief. "We think we're the best team and that we can win it." After starting his career with Middlesex before moving to Essex in 2008, it took a late-season move to Edgbaston in 2011, intitially on loan, to generate Wright's career. A call-up for the England Lions followed, only for his international ambitions to be put on hold. But now Wright is hoping that his nine-month break from first-class cricket can get both him and the Bears bouncing again. "A better season for Warwickshire might help honours come on the back of that," he points out. "Without sounding too much like a cliche, the best way to make a point is to do well for Warwickshire." Wright's final haul in The Parks, when the rain-ruined game against the Oxford University students came to an end, was 2-31 from 12 overs. 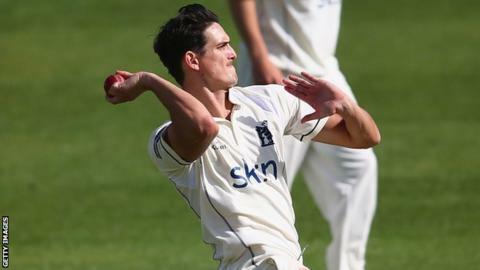 England's Jonathan Trott, who took 2-8 from five overs, and winter signing Richard Jones also weighed in with a brace of wickets apiece, as the undergraduates laboured to 181-9 from 71 overs, the Bears having declared at their overnight score of 388-7.